Tarushi Gupta of class 9th National Topper in Saevus Eco Achievers Olympiad got 8th position. She received trophy, Gold medal and Certificate. At the Interfaith Harmony Week held on 4th and 5th February, 2019 organized by CMS, Asharfabad Campus, Samaira Parveen of class VI I won 1st Prize in Declamation. Rupal Singh 5 B, Kritika Chandel 5 B, Varya Mishra 5 C Aakshita Singh 5 C Raaghvi Bharti Sahay 5 F Rashika Agarwal 5 F, Lakshita Mishra 5 F, Krapa Gupta 5 G, Vanisha Vishvani Jaiswal 5 I, Vedanshi Tripathi 5 C won 1st Prize in Prayer Dance too. Nine students from our campus participated in Techniche -2018 held at IIT Guwahati. These students won 1st prize for two events namely Animate and Astrphyesta. Our team also bagged the AI workshop and general championship at the annual technology event of the INDIAN INSTITUTE OF TECHNOLOGY,Guwahati held From 30th August to 3rd September. Approximately 107 teams attended it from the most prestigious school and colleges cross-country. 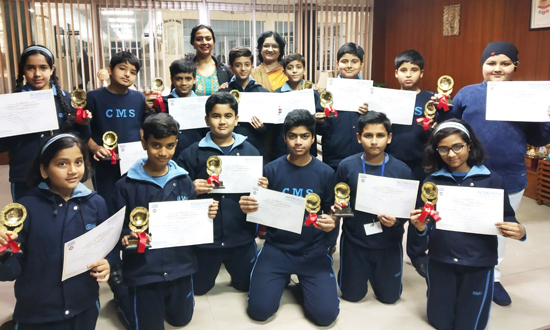 The names of the students are Aman Kumar, Singh,Vivaan Gupta, Abdul Jawad Khan, Rudransh Goyal, Prakhar, Yash Aggarwal, Lalit Krishna Yadav, Yajat Pathak and Aamish Ahmed Beg. They were also invited to the tech fest of IIT- Roorkee in February 2020. Mr. Athar Qureshi headed the team for this event. 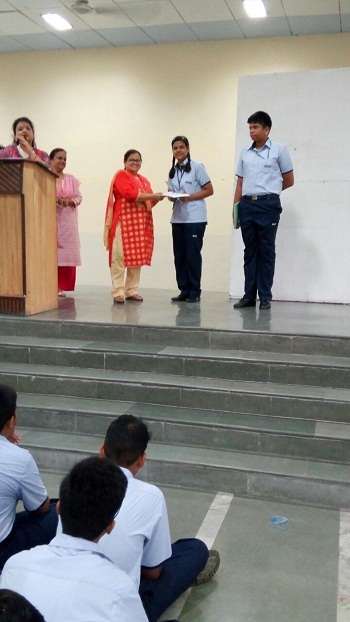 Yajat Pathak of class IX won third prize in Pandora's Box and also third prize in the Third Front. 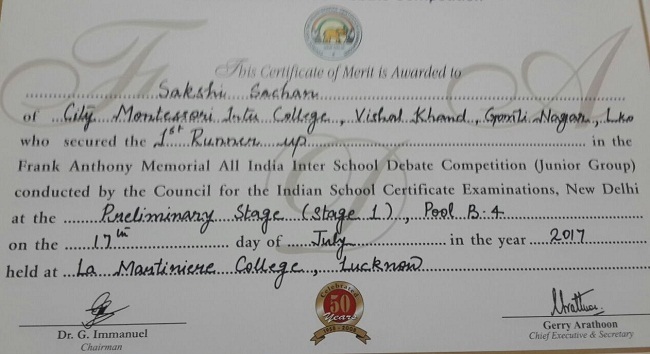 The Frank Anthony Memorial All India Inter School Debate Competition (Junior Group), Preliminary Stage( Stage 1) conducted by the Council for the Indian School Certificate Examinations,New Delhi was hosted by La Martiniere College, Lucknow on 17th July,2017.Sakshi Sachan of class IX B won the 1st Runner Prize(For the motion) and along with Adhwant Mishra of class IX B both won the 1st Runner up Team in the competition. Sakshi will now represent Zone-A in the Regional Round. 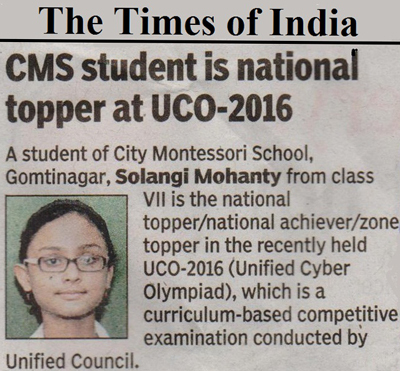 Congratulations to Solangi Mohanty for being National topper at Unified Cyber Olympiad 2016.It is a matter of great honour and pride for all of us at CMS that Solangi Mohanty from class VII participated in the Unified Cyber Olympiad 2016 (UCO-2016) and emerged as the National Topper. It is a curriculum based competitive contest conducted by Unified Council. The council invites students with an aim to make them aware with the latest changes and developments in the field of Computer Science and Technology. Thousands of students participated in the examination with full enthusiasm to prove their skills and indepth knowledge. These participants took part after qualifying zonal and state level examinations. 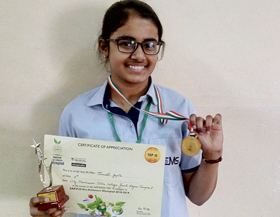 Solangi Mohanty, after being zonal and State topper, gave her hundred per cent and emerged as national topper and national achiever on the basis her of speed and accuracy. 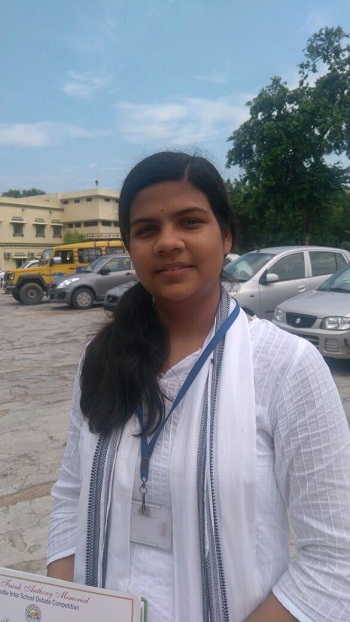 Please congratulate Solangi Mohanty once again along with her computer teacher for emerging as the national topper at UCO 2016 making her school and percent proud. Abhichetan won national level rank 10 in International Hindi Olympiad organised by Hummingbird.